Mollie, a little old lady? 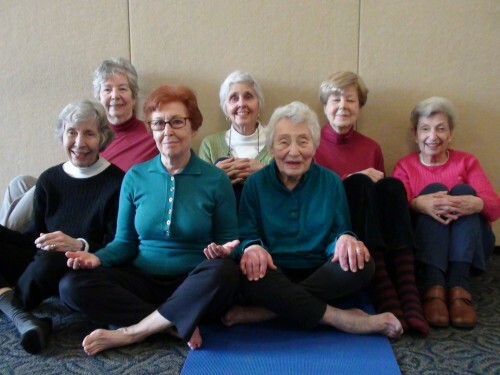 I have been fortunate to be Mollie’s yoga instructor for the past six years at the Sinai-Free Synagogue in Mount Vernon, and have never thought of her as an “old lady”. 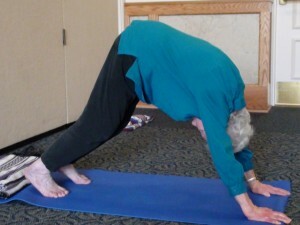 Mollie looks delicate, but she’s been practicing yoga for nearly 50 years and is made of sturdy stuff, inside and out. Over the years, her physical practice has become more gentle: she hasn’t done a Headstand in decades (“it never thrilled me,” she admits), and has had to bypass asana altogether after illness or surgery. But Mollie still loves her Warrior poses and Adho Mukha Svanasana (Downward-Facing Dog), and don’t dare try to keep her from Viparita Karani (Legs Up the Wall), her favorite asana. And at the end of every class, her distinctive rumbling “om” is always the longest of all. Active in body and mind, Mollie is a gentle warrior in the practice of yoga and an inspiration to anyone who has seen her on her mat. When she was diagnosed with spinal stenosis several years ago, she refrained from asana until she received the okay from her doctor. But she still came to her beloved weekly class (“I’ll do the poses in my head,” she would tell me) and participated fully in the breathing, meditation, and relaxation components. Born and raised in Mount. Vernon, Mollie celebrated her 91st birthday in early March with a festive family brunch at X2O Xaviers on the Hudson on the Yonkers waterfront. The oldest of three children, she graduated in 1937 from A.B. Davis High School (now Mount Vernon High School) and started working as a bookkeeper in Yonkers. 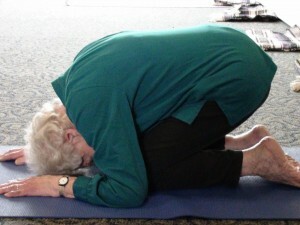 Mollie started practicing yoga in the late 1960s. She heard about a Hatha yoga class offered at the YMYWHA in Mount Vernon. Accompanied by her younger sister, Adele Arpadi (“she was the first one of us to stand on her head,” Mollie says), she showed up to learn–and never left. It was definitely a case of love at first squat. The practice of yoga was different then, Mollie insists. “There weren’t so many types–you just did yoga!” she says with a laugh. You didn’t practice in yoga pants or comfy sweats, either–leotards were de rigueur, Mollie recalls. And her yoga “mat” was made of stair carpeting, cut to size. “We got the measurements from our first teacher, Atmananda Lesser, and had the carpeting cut at a five-and-dime kind of store,” she says. Mollie loved doing the poses–especially Sun Salutations–but the practice was never only about asana: friendship and building community were just as important. The students attended retreats in the Catskills, made a pilgrimage to the Kripalu Center for Yoga and Health in Stockbridge, Massachusetts, and held practice sessions at each other’s homes when the class went on summer hiatus. “Through the years, yoga has had ups and downs. Sometimes it was very popular; other times it fell by the wayside. But we were always there,” Mollie says proudly. Her much-loved class has gone through many changes: teachers have come and gone (past instructors include Barbara Kestenbaum, Tao Porchon-Lynch, and Reyna Gonzalez); the class day and time have varied; and six years ago Mollie had to find a new location for the class when the Mount. Vernon Y closed. Her sister Adele left the practice after a series of strokes, and several former students have passed away. But new students have come to take the elders’ places, and all the students, both veterans and newbies, look to Mollie as the class leader. Mollie and her classmates: clockwise from Mollie’s left are Francoise, Irma, Virginia, Alida, Marilyn, and Rhoda. “I once had a T-shirt made up that said ‘Ask Mollie’,’’ says Rhoda Rothman, a longtime classmate who moved to Mount Vernon from New York City in the 1960s. Still spritely and elegant at 88 years of age, Rhoda describes Mollie as a record-keeper and organizer. “Whenever we had a question, we always turned to Mollie,” she says. When Mollie celebrated her 90th birthday, her classmates took her out to celebrate. (They often go out for brunch after class, too.) She warns that she expects the same treatment when she turns 100. To help her get there, she takes an exercise class (also at the Sinai-Free Synagogue) two times weekly in addition to her Tuesday morning yoga. She walks whenever she can, and dutifully practices the physical therapy exercises she was given when diagnosed with spinal injury. “If I don’t have that much time for them, I can count to ten real fast,” Mollie jokes. 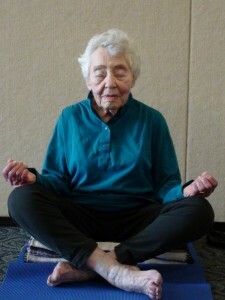 Of all the choices Mollie Vogel has made throughout her lifetime to benefit her health and longevity, yoga is the most dear to her. A reliable friend in good times and bad, her yoga practice is forever woven into the fabric of her life. This entry was posted on Saturday, April 9th, 2011 at 10:22 pm and is filed under Article, Yoga Profiles. You can follow any responses to this entry through the RSS 2.0 feed. You can leave a response, or trackback from your own site. Mollie, This article brought back so many wonderful memories. I love that you are still practicing Yoga. Me, too. We had such a special community’;filled with love and friendship.